Saturday, 23rd June 2018 at 7:00pm;	Gloucester Cathedral, Gloucester GL1 2LX. We venture into the marvellous Venetian sound world, performing in the superb surroundings of one of our greatest English cathedrals. 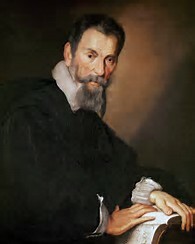 Monteverdi bridges the Renaissance and Baroque eras with his revolutionary musical ideas that strike us as remarkable even after 400 years. 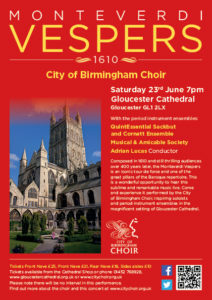 Contrasting soloists and full choral sound, including antiphonal choirs and echoes, with period instrumental orchestral ‘choirs’, you will certainly enjoy hearing these exciting responses, psalms, hymns, motets and, as the finale, the Magnificat (song of the Virgin Mary) in historic Gloucester Cathedral. We are certainly looking forward to performing them and hope to see you in the audience. 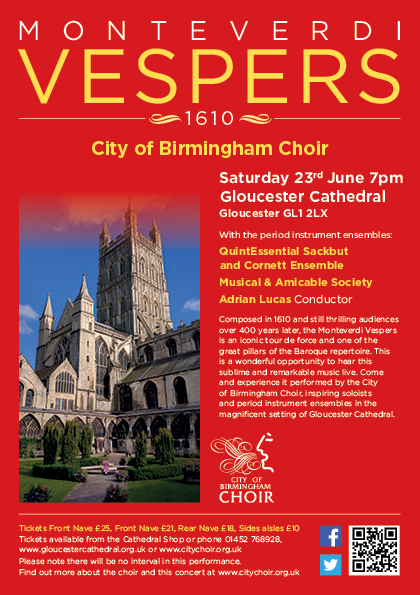 Tickets are available from Gloucester Cathedral box office. Click the BUY TICKETS link to go to the booking site. Price ranges £25.00, £21.00, £18.00, £10.00. Please note – there is a transaction fee of £2.50 charged by the box office.